We like scout masters and in fact have a lot of respect for them and others who support the youth audience. The campaign is a humorous commentary about people’s obsession with popularity. It is meant to be a bit of fun and clearly not meant to be taken at literal face value, and we’re sorry if it’s caused you any offence. Our focus has always been to target the youth market and the Great Deals For Popular People campaign is about Phones 4u offering great value deals. The aim of the campaign is to engage with our customers and reinforce what we’re about as a brand through fun, tongue in cheek advertising. We like scout masters and in fact have a lot of respect for them and others who support the youth audience. Right. 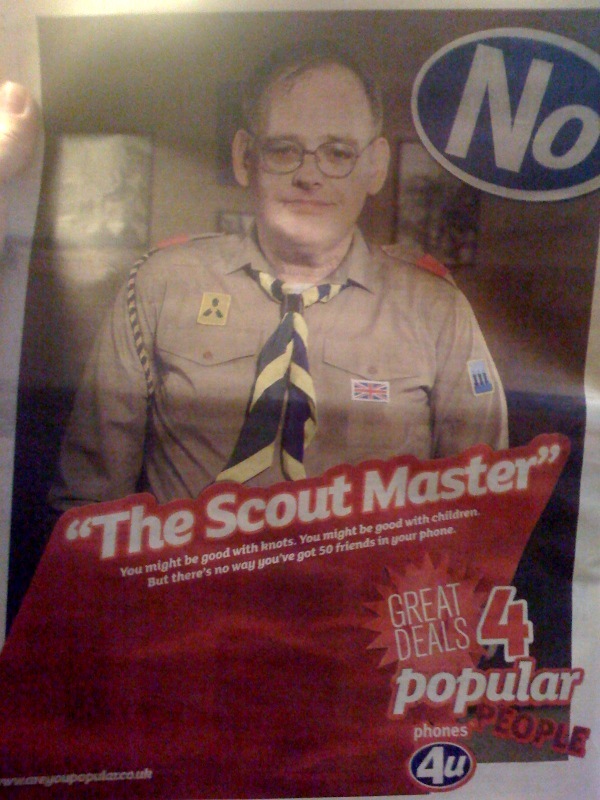 You used an unattractive picture of a model dressed to look generally unattractive (woggle askew, glasses, bad hairstyle, awkward pose) and then suggested that because he was a scoutmaster it was unlikely that he would have many friends. That doesn’t really seem to scream “respect” to me. Being a scoutmaster, sadly, has a negative image. People are scared to become scoutmasters because they think people will think they are sad, weird people. Do you think your advert is likely to help dispel this negative image, or will it instead reinforce it? The campaign is a humorous commentary about people’s obsession with popularity. In what way? In no way is the bloke in the advert depicted as someone obsessed with popularity. Quite the opposite in fact; he’s chosen to pursue a path that is likely to lead to him being ridiculed. Surely the whole theme of the advert is to say, “You’re not a loser like this bloke, you have friends, so you should sign up for our new loads-of-friends package”? It is meant to be a bit of fun and clearly not meant to be taken at literal face value, and we’re sorry if it’s caused you any offence. Well you’re not really sorry then, are you? Because you’re saying that if I’ve been offended in any way, it’s because I’m a humourless person who’s taken something that should be fun and isn’t offensive at “literal face value”. It’s a classic non-apology, like the difference between saying “I’m sorry I hurt you by pushing you down the stairs” and “I’m sorry that you injured yourself due to the poor technique you used while falling down the stairs”. Yeah, that’s pretty much how humour used to work when I was young and at school. Pick a target who isn’t you or anyone in the group you’re trying to appeal to, and then make yourself look big and clever by taking the piss out of them. I’m aware I might well be looking very stiff and humourless here, but I’d like to think that in all the humour I’ve written over the years (and I’ve written a lot) I’ve taken care to never take the easy way out of just taking the piss out of easy targets. Oh well. I’ve said my piece so I should probably shut up. Be interesting to see if the Scout Association have any comments. I think that scouting is a really good pastime for children. It breeds character, confidence, and helps build them into the citizens of tomorrow, which in a world where a good chunk of them are walking around with knives stabbing people is in my opinion a pretty important thing. And I consider the adults who volunteer their time to run scout-groups to be very good people doing a very good thing. It’s just a shame there aren’t enough of them: the Scout Association is 6000 volunteer adult leaders short, and as a result 33,000 children are on waiting lists to join. Bear Grylls – adventurer, former SAS member, and the youngest person to climb Mount Everest – agrees with me. 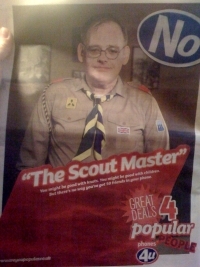 He’s just been appointed Chief Scout of the UK Scouting movement, with a declared aim of recruiting those 6000 leaders. That’s him in his uniform to the right. But there’s nothing good-humoured nor affectionate in suggesting that a man is lacking in friends due to the type of man he is, and that – by implication – he isn’t therefore worthy of friendship. This is the lowest, nastiest form of humour. It’s the sort of nasty “laugh at the outsider” type of humour that bullies at school used against geeks like me, and the fact that their humour worked with the cruel masses only made it more hurtful. Maybe that’s why this advert so enraged me. If the people at Phones4U (and with a name like that, why am I surprised that they turned out to be wankers?) 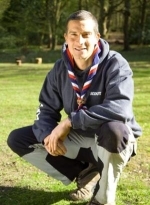 really, genuinely think that scout-masters are worthy of public ridicule, why don’t they put their opinions where their mouth is and rerun that advert with a picture of Bear Grylls? Or better still: find him wherever he happens to be, and tell him what they think of scout-masters to his face. That’s an advert I’d like to see.